I am used to making kuvale sasam, kuvale koddel aka puli koddel, kuvalein ambat with turdal... whenever ash gourd is purchased at home. 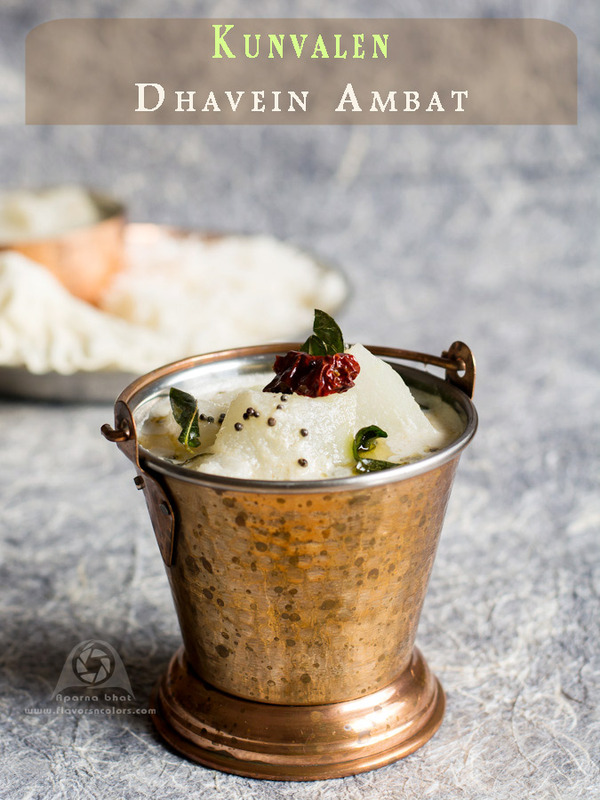 The recipe of Kuvale dhavein ambat from Asha aunty's cookbook "The Konkani Saraswat Cuisine" was something new to me. Had never heard it till now or probably mom must have prepared this dish with some other name. Thus, I felt like tasting the dish and decided to try it when I bring the vegetable home next time. Kuvale is konkani name for ashgourd/ winter melon and dhavein means white in color. So the name suggests that this curry is white in color probably the color attained after adding curd to the dish. So here I am with my try and would like to share the recipe that I adapted from the book. For the exact recipe you will need to buy the book. 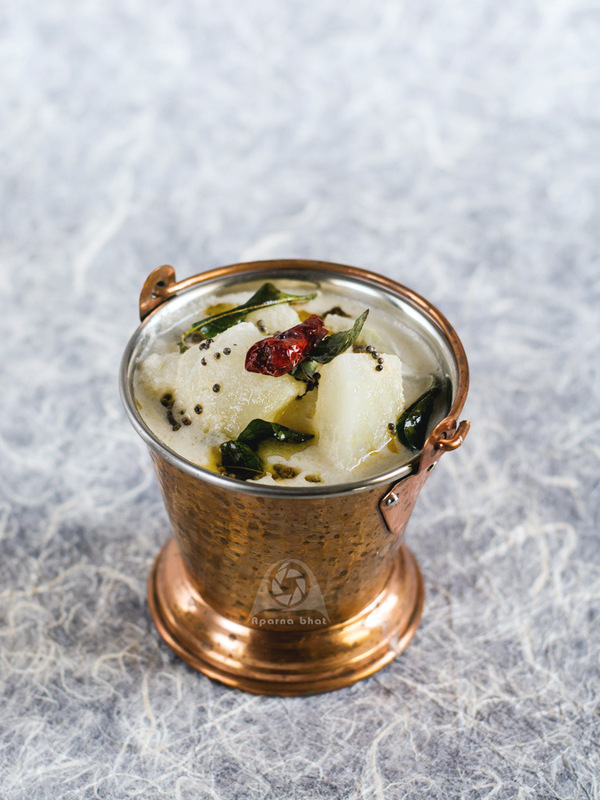 I have used tamarind in place of curd, the quantity of grinding ingredients is taken in proportion to the quantity of veggie used and pinch of asafoetida while seasoning. A mildly spiced curry with the sweetness that oozes out in every bite of ashgourd piece, my family thoroughly enjoyed this curry served with hot rice. Clean, peel and cut the ash gourd into 1" cubes. Place them in vessel immersed in little water enough to cook them. Add salt and cook until soft and take care they don't get easily mashed. Grind the ingredients as mentioned under 'for grinding' to a smooth paste. Add this paste to the boiled ash gourd pieces, mix it nicely. Adjust the consistency of curry by adding required amount of water [You can use the water that is used to clean the mixer vessel] and bring it to a boil. Now prepare the seasoning, heat coconut oil in pan. Add mustard seeds and allow it to splutter. When it happens add broken red chilli, curry leaves and pinch of asafoetida and pour this seasoning on the curry. Switch off the flame and cover the vessel with lid. Enjoy it with hot rice and papad. This looks perfect. Love it. I love your blog.. amazing pictures and wonderful write up. I am a konkani myself and enjoy your posts.. we make a similar dish with the same name, we call it the dhave (white) ambat with potatoes, kuvale and taro roots. We grind coconut and green chillies and instead of tamarind, we add yogurt to the dish and then a phanna of mustard seens, jeera and methi. @ Anu : thnks dearie for ur feedback abt the blog, pictures and writeup [which i am not at all good at :P] ... abt the ambat ,,,the recipe in the book did mention abt use of curd instead of tamarind but i thought of avoiding it as of now the season being extreme cold here... nice to know ur way of making it that too with so many veggies ...i m sure with that methi, jeera in the phann it will taste yummy. will try it one of these days and give u my feedback !